Happy New Year everyone! I am absolutely trilled to be taking part in this year's Seasons Givings Blog Hop! This is a blog hop with a difference - each participating blog will not only have some crafty inspiration waiting for you - each blog will also have a sweet crafty surprise to give away! What a fantastic way to start the year - you might just be the lucky winner of some fantastic crafty goodies! As my inspiration today I'd like to share my last winter themed card for this season. Like the Angel on the card, I'm blowing the snowflakes away - except I am wishing for the winter to end and for the spring to arrive before too long :). I hope you'll like this card and that it will encourage you to look around my blog to check out my other projects as well :). You might like to have a peek at my Top Ten Picks from 2015 - a collection of my favourite projects from the last 12 months :). 1. Prepare an A6 card blank from purple cardstock. 2. Trim a panel from White Media Paper 1/16th inch smaller on each side. 3. Sprinkle the powders, glitters and mica fragments from the Teal Kit over the panel and heat from underneath using encrusted jewel technique. 4. Embellish the panel with silver photo corners and purple ribbon. Adhere to the card base using Extreme tape. 5. Stamp the Crystal Angel in black onto Media Paper and colour in. Stamp the Angel again onto scrap paper and cut it out. 6. Use the cut-out Angel as a mask to cover the Angel on your main stamped image. Using the spritzer tool air brush the background snowflake with pink, purple and blue markers. 7. Fussy cut the image and adhere it to the card over the foam tape. 8. Decorate a foam snowflake with pigment powders and Royal Purple Glass Glitter and adhere it to the centre of the image. 9. Add highlights to the image with the Clear Star pen. Giveaway #1 - How To Enter! As it's a Season of Givings I'm giving away not one, but two generous bundles! :). To enter my Giveway #1 simply leave a comment at the end of this post letting me know what your New Year's resolution is (or are?) - crafty or otherwise. My New Year's Resolution for 2016 is to get a new (bigger?) craft room - how's that for a challenge? lol :). So now I'd love to know what you want to aim for in 2016! You do not have to become a follower of my blog to enter this giveaway but I would be delighted if you chose to become one :). You can follow my blog via the Google Friend Connect ('Join this site' button in my sidebar), on Bloglovin' or by subscribing by email (or you can enter your email in the sidebar gadget). You can also find me on Pinterest, Instagram, YouTube, Facebook, Twitter and Flickr :). Giveaway #2 - How To Enter! The Giveaway #2 is my way of saying 'THANK YOU' to my lovely blog followers and those who take time to leave a few words on the projects I share - you are the reason I keep blogging and keep sharing my crafty potterings. Thank you so much for all your friendship and support in 2015! To enter my Giveaway #2, please become a follower of my blog (if you're not one already) and leave a comment on any of the projects I blogged in December 2015. The number of comments you leave will equal the number of times your name will be put in the hat :). To become a follower you can use the Google Friend Connect button ('Join this site' button in my sidebar), you can follow me via Bloglovin' or by subscribing by email (or you can enter your email in the sidebar gadget). Ps. You can also find me on Pinterest, Instagram, YouTube, Facebook, Twitter and Flickr :). Both giveaways are open internationally. You can enter until midnight (GMT) on 6th January 2016 and I will draw the winners on the 7th January 2016 :). I will endeavour to contact the winners directly - please be sure I can easily find a way of contacting you back - either via your blog or by leaving your email with your entry. If the contact is not successful, I will draw another winner/s. Every single participant has something exciting to give away so be sure to visit them all and enter in the drawings. Your next stop is: Jennifer Ingle aka JINGLE :). Happy New Year everyone, may the New Year bring you many happy moments to share and new blessings to cherish. And my heartfelt 'thank you' to Latisha Yoast - the fabulous lady who's behind this fantastic idea of Seasons Givings and who's committed a great amount of time to make it all happen! Good luck and warm festive hugs! Such a fun card. As you're wishing for snow to leave, I'm hoping for snow to arrive. Maybe your snow fairy will blow some my way! Happy New Year! My resolution... make more cards to spread more peace and joy!! Happy New Year! And thank you for the generous giveaway! Beautiful card, we haven't had any snow yet in Northern Ireland, just LOADS of rain! My crafty goal is to tidy my stash and keep it tidy! Your card is so pretty! My resolution is to get rid of excesses of things I haven't used in years. My new year resolution is to eat healthy and continue making layouts and mini album. I don't do resolutions. But, I do hope to send out more cards to family and friends this year. I am now following you on Bloglovin'! Happy New Year! My resolution is to use more of my stash fabric than I bring in. I already follow you on Bloglovin, and I'll go see if I have commented on your other projects. Thanks so much for the chance to win such fabulous prizes! Great card! I love the colours. I've resolved to try no-line colouring at some point. I've been chicken about it, but I'm gonna give it a go! Thanks for the chance to win, my email is clanrichardson at hotmail dot com. Happy New Year!! Your card is just beautiful! My resolution is to take better care of my health. Thanks so much for participating in this amazing blog hop and for the chance to win some wonderful goodies!! Happy new year! Love your work. Your giveaways are awesome, thanks. Best wishes on 2016. I am now following everywhere! Had been following on Youtube and Instagram but now I've subscribed to all your social media. Wish you success in everything this year! This is one of the best blog hops I've ever seen. The talent of all you is amazing. I resolve to finish writing my novel this year and begin the submission process. Stunning and magical card! My wish for 2016 is to enjoy and appreciate the little things in life. This year I want to spend more time encouraging people and spending time with those who need it most. Blessings to you in 2016! My resolution to use what I have without buying more stuff to add to my ever growing stash. Happy New Years! I like your project, very different style than I do, its lovely! Good luck with getting a bigger craft room! I hope to finally get mine set up I need a bigger desk and more storage! What a lovely card and lots of great inspiration! Happy Happy 2016! This year I hope to scrap more photos. I am hoping to keep organizing my craft room and to make more cards! Have a wonderful New Year! I think your fairy card is just awesome. Gorgeous colors! Fantastic giveaway - thanks! I'm hoping to stay on top of birthday and holiday cards this year -- no more belated cards. lol Happy New Year! My resolution is to clean up my studio so I am more motivated to play in it! Happy New Year! Enjoy something everyday. Fantastic hop and prizes. Thank you. This year I am going to loose some weight. Seriously. My new year's resolution is to continue to stay healthy and happy. At 75 I feel that I am blessed to not have to take any medicines, can do what I want (go to Hawaii in a couple weeks) and play with my crafting materials any time I want. thanks for the offer of a great gift. I just became a follower. Love your designs. I've posted on a few of the latest entries. My goal this year is to start embroidery. Beautiful giveaway! My crafty resolution is to get really good with copic markers, and build up my collection! Have a warm and crafty 2016! Thanks to the bloghop, I discover your site. My new years resolution : try to experiment with watercolour backgrounds; and for once : try to make my Christmas cards in time -- they always end up as New Years cards. Happy New Year, with lots of inspiration ! Thank you for the chance to win. Amazing giveaways. Happy New Year!! I really want to be more organized!! My new year's resolution is to be more active! That has been my NY's res for about.... 10 years now... tee-hee! But maybe this year I will succeed! lol. Thanks for the chance to win those goodies! You are very generous. Happy New Year! That is a beautiful project. Great color combo. I plan on getting better organized, eating better, cleaning out some closets, taking more time for me. That is just the beginning. no resolution per se, but i'm looking forward to growing my etsy shop! My resolution is to make something creative everyday, even small things, so that I can try and avoid those creativity ruts. So many beautiful giveaway. Thank you for the chance to join the game. Happy New Year. For the coming year, although I don't usually make resolutions, I'm going to try to make a card for every one of my many, many, many family members, even though I'm in a very small rental house while our new home is being built and I can't find a lot of my stuff! Happy 2016. Your site is fantastic! I'm signing up to be sure I don't miss anything from you. LOVE IT ALL! I am resolving to use up my stash and create MORE than I buy!!! Happy New Year! Thank you for this wonderful blog hop! So much fun and so many amazing prizes and inspiration. My resolution is to create something every day! Your card is gorgeous! I love the colors you used. My goal is to send out my cards on time this year! I'm always late. Thanks for the chance to win two fabulous prizes. I'm going to go follow your blog now and take a look at your projects. I am going to try to make a card a day. Wow - what a great giveaway and looking at your blog who wouldn't want to follow! Such great cards and inspiration!! I want to do more mixed media projects. What a great giveaway - thanks so much for a chance. I hope to make cards in a timely manner. I love fairies and the color purple.....when I seen your card, I told myself I will have to try something like it! Being new to card making, I am slowly discovering different designers to follow. Will definitely add you to my list! I resolve to make more time for myself to explore my artistic side! My new year goal is to be more organizes and fit healthy! 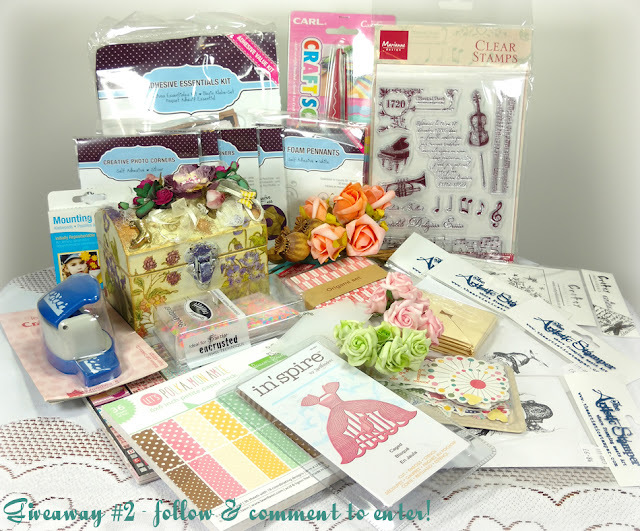 Thanks for the chance to win such fabulous crafty goodness! Wishing you a very Happy New Year filled with joy, health and happiness! What fantastic giveaways Asia. This year I plan to use my stash more and experiment with my new goodies (Paints and pencils).Also to organise my craftroom more. Happy New Year Asia,hope to see you this year too! Have always loved your style and projects ,however i dont always leave a reply to say i visited, so i am going to make an effort to reply more . I am a new follower,thanks for the chance to win. My goal for this year is to learn making scene cards. Dawno nie "buszowałam" po blogach. Sama coś tam dłubię, wykanczam te materiały co mam i szykuję się do wyjazdu :) Tak z mega opóźnieniem, ale jednak! No i może coś nowego by się przydało na początek? Your card is beautiful...love the colors! crafty goals? Seems pretty simple but has always been a challenge, design more birthday cards and send out more pretty mail! Happy New Year 2016!! I'm now your newest follower. Thanks for the opportunity to win. Great inspiration, you’re so talented. Looking forward to see another awesome project! Thanks for the chance to win this awesome goodies! Lovely and so creative. I love all of your creations. So many inspiration to make crafty things. I am a new follower (I promise, NOT a stalker) BUT I did as you asked and checked out some of your Dec. work and it is AMAZING! So I will def. BE BACK! My New Year's resolution is (besides getting re-organized) is to learn to water colour. Thanks for the chance to win your amazing gifts. Great cards! ! I plan to organize my crafts! ! Wow! you do beautiful work. I am a new follower on Bloglovin and Google connect. I also posted a comment on your Christmas is in the air post for December 2015. What a beautiful postcard. To be come more organized and productive! Thank you for a chance to win and a Happy New Year to you! My resolution is to use the products I have before buying more, be more creative. Thanks for the chance to win. Your cards are lovely. I already follow you because I absolutely adore everything you create!!! My resolution for 2016 is to release all the negativity from my life and to learn a new craft or technique each week! Happy New Year!! It's hard for me to make resolutions, but I plan to make my birthday cards a month in advance so I can get them in the mail on time. Thanks for a chance to win a fabulous prize package! Wishing you a happy and blessed 2016! I'm a new blog follower! I'm excited to see your projects. My favorite project from your December post is the Sunflower wedding card! Simply gorgeous! I hope to make more 'me time' in 2016! Hope your New Year is magikal! What an amazing card! My goal is to spend more time with family! Gorgeous card with lovely coloring! I am a new follower here! Happy to have found you through this awesome hop! Your Snowy Postcard is my favorite project from December! Trying to get more organized is my resolution for the new year! Oh, WoW! I love that gorgeous background on your lovely card! Thanks for the chance to win one of your fabulous gift packages, too... now following you! I want to be more active, drive on highways so I can give a break to my husband. On the crafting side, I want to get into Copic coloring and more watercoloring. I want to create more cards instead of just admiring other people's work. My goal for next year is to spend more "quality" time with my family. Your blog is fantasctic. Thanks for the great gift offer and the chance to win. Happy New Year! 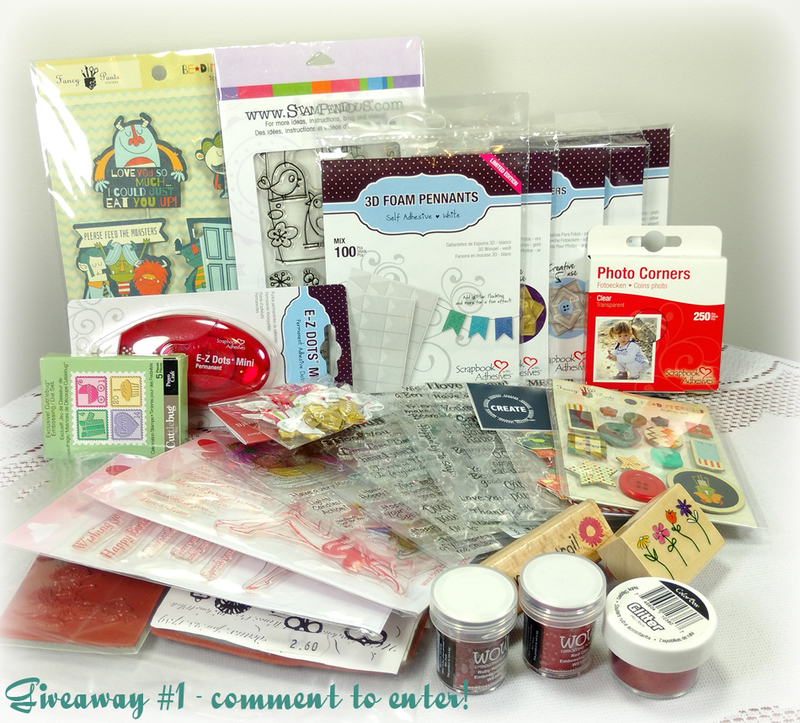 Thanks for taking part in this fun blog hop and for the great prize package you are offering! Best wishes for a very blessed 2016! happy new year. thanks for hopping and being part of this great give-away. What a beautiful card, thanks for the chance to win. Wow! I am clearly a newbie, as I don't even know what you are talking about in your instructions for your very beautiful card. It is truly amazing. Thanks so much for sharing the card, as well as the chance to win some really cool products! Love this color combo for winter cards. My resolution is to finish old projects. My wish is to have more time for my paper crafting. Following you on bloglovin and I love your angel card! Your creations are so pretty! I have only 1 resolution and that is to pray more! Thanks for your generosity! Stunning card! Beautiful color combination! I hope to make and send more cards in the coming year. Best wishes to you for a very happy 2016! Wow! What a giveaway!! I subscribed by email to your website and looking forward to your creativity :) Happy New Year!! Back for a second comment. Yes, I do follow your blog. I think my favourite of your projects was the card you made using the Tim Holtz tag as inspiration. Very beautiful. Cheers. One resolution for 2016 is to make and send more cards! Thanks for offering this giveaway! Happy new year and all the best in 2016! My crafty resolution is to go out of my comfort zone for colour combinations! No resolutions for me! Would like to pray alot more though! You work is gorgeous, so pretty! Thanks for the generous prize! I didn't make any resolutions this year. Your design is so pretty and magical! Thanks for the generous giveaways and Happy New Year! Really I do need to get more organized, really I do, so that's my goal. Wow is your creation gorgeous! I would become a follower without the prize...but thanks for the opportunity to win! Happy new year...and now I'm checking out what other tasty projects you have here! Great card love all the layers and colors. Thanks for the chance to win. My resolution is to organize my craft room and create more. My goal is to make more cards using the stash I have. Following your blog! :). Beautiful card!!! Happy New Year! Forgot to say what my goal is.... My goal is to be kinder to myself! My resolution is to spend less time in the office and more time with family and doing things i love(crafting, reading, cooking). In order to start this year healthy, i signed up for a green smoothie 30 day challange - love it! My resolution is to be more content and use what crafting supplies I have before buying more. It's going to be easier said than done! HAHA! Crafting resolutions are to get organized and to actually do the cool techniques I always look at :). 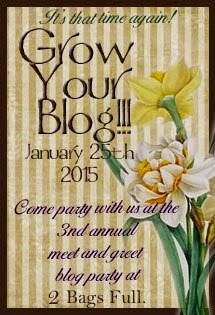 This blog hop is great!! I've been introduced to many new blogs, products and websites. Thank you. Happy New Year!! I love your beautiful angel card! Such perfect colours too! My, what a give away!! Holy Moly! New Year's resolution hmmm... I think to try and not stress about the little things and to try and get ahead with my Thursday Group projects! Have a fun day! Happy New Year! Thank you for this amazing chance! Your card is lovely!!! My New Year's Resolution for 2016 is to improve my techniques and make more cards. I'm a newbie and I'm not so good to realize beautiful projects! Another of my goal is try to be more positive and an healthy diet! Thank you again! Follow you on Pinterest, FB and YT as Arianna Barbara and on Twitter as raggiodiluce82 and subscribed via mail to yor blog. Happy New Year! Beautiful card. Loving this hop. I'm resolving to concentrate on the healthy part of life, whether it's through nutrition, fitness or being creative! Happy New Year! Your angel card is so pretty. Love the soft serene colours. My resolution for 2016 is to make sure I do more scrapping and paper crafting. 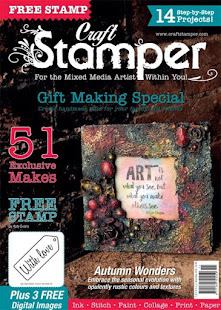 I want to dig out all my stamps and inks and glitter and make sure I put them all to good use. Beautiful goodies. My resolutions are to make sure I make more time for crafting and scrapbooking, and try new skills. Health and creativity are my goals for 2016. Beautiful card! Amazing giveaways! 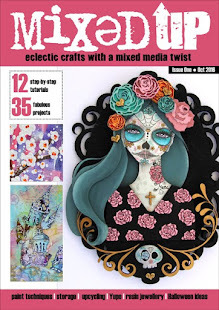 Great inspiration found on this blog hop! Amazing giveaways. #! resolution is to gain Serenity. #2 - follow on facebook. Happy New Year! My resolution is to quit smoking. That card is beautiful. So inspiring! Thank you for the opportunity to win such great goodies! Beautiful card and wonderful giveaways! I resolve to watercolor some more. I'm no artist, but I really do enjoy watercoloring. It can be so relaxing! I now follow your blog via Google friend connect! My crafty resolution this year is to create a unique style by blending my newly learned papercrafting techniques with my love of pop up cards and 3D papercraft. To learn new techniques and get better at others. Happy New Year's! I am looking forward to changing my guest room into my craft room. And I am following you via email. Hi, my new year resolutions where to go to bed earlier, but failed already. Not to buy so much craft stuff and use the stuff I've got (ha ha). I'm new to your blog and have just followed you via Bloglovin'. My New Years resolution is similar to your, but I will not have a bigger craft room. Instead I plan to organize it so that it feels bigger. ;). Wish you luck with getting your bigger craft room! Happy 2016! Thanks for sharing your beautiful card. happy new year! my crafty goal is to finish one project a month from my list of unfinished projects! Your angel card is beautiful. I never got to create with mine but just might do that tomorrow, lol. Thanks for the chance to enter your giveaway. I'm a new follower of your blog. I aim to get myself sorted and packed this year so I can move in 2017 while still creating cards to send to friends and family. My goal in 2016 is to learn to watercolor on my cards!! Happy New Year from Alaska! Thanks so much! I would love to craft more and spend less time watching videos, reading blogs and scanning pins. It is easier said than done! Happy New Year! My goal is to organize my crafting space so I can craft more efficiently and more, TFS, happy and prosperous 2016! Lovely card! My resolution is to learn how to use my new cricut machine and make some beautiful cards and crafts. thanks for your giveaways. Happy new year! In 2016 I resolve to get my crafting room in order, to weed out the products that I just don't use, and to try some of the new products that are now on the market. And the end result of that resolution is to share more handmade kindness with others. Your card is beautiful! I am hoping to downsize; however, I want my next craft room to be larger! We have to have our priorities - ha! Thanks for the chance to win one of these great prize packs to help fill up the extra space! I want to get back to scrapbooking and learn to color better. One of my goals this year is to make time to craft more, so that I can send out more handmade love to friends and family! Thanks for the chance to win! Please enter me in the drawing. My resolution for 2016 - daily creative practice and yoga at least 3x a week. (gotta make them do-able). Follow you on bloglovin and enjoy your work. My goals for this year are to Declutter my life and take more time for crafting!!! I'm starting to follow you on bloglovin and Pinteres and look forward to seeing what you create this year! My resolution is to have less clutter in my home. Happy New Year. I don't make resolutions, too much pressure. lol Thanks for the chance to win one of these amazing prizes. 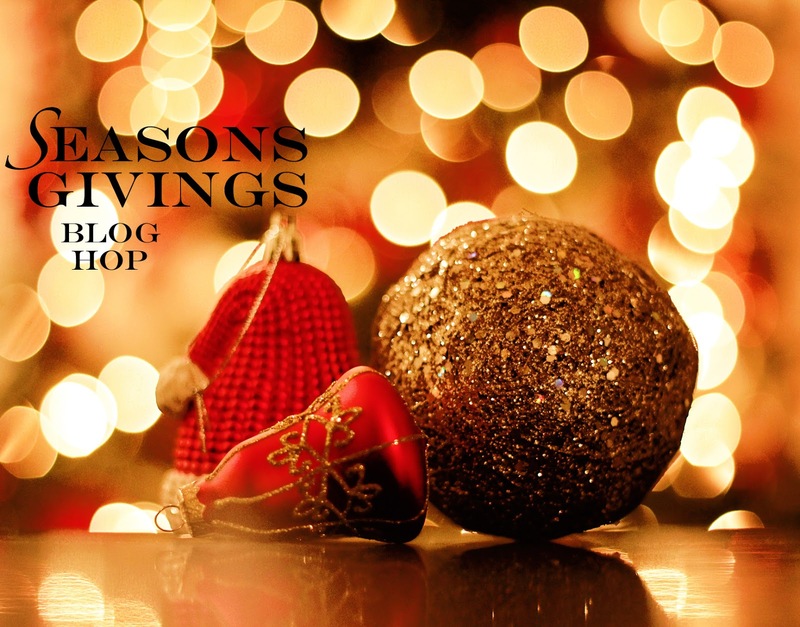 Thank you so much for taking the time to participate in this blog hop and offer not only one but two awesome and generous prizes as giveaways here in your blog! That is very kind of you! I don't really make resolutions, but I have sorts resolved to organize my craft space and to try to be better at using what I have before going out and buying new things. I hope you are able to get a bigger craft space this year, or at least find happiness whoever you do your crafting. Have a wonderful New Year. I'm resolving to be as positive as possible and try not to get annoyed by little things. Also want to meet new people. I really don't have any resolutions this year, but I do want to experiment more in my crafting. 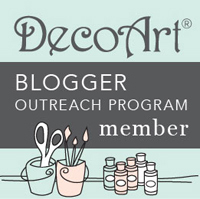 I joined your blog and am looking forward to checking out your 2015 projects! Thank you so much for being a part of this Fantastic blog hop! I'm soooooo glad I found your blog. Looking forward to your crafts in 2016. HAPPY NEW YEAR!! Not sur what I have to do to enter second one? Is joining your email enough for one entry? My resolution for 2016 is to create more, so i can justify shopping more :) What a great giveaway! Thanks for sharing! Brand new follower! Wonderful giveaways. This year I resolve to spend more time creating! Thanks for the chance to win a really nice prize package!! THANK YOU for a chance to win your blog candy! I'm a new follower...resolve to get my studio unpacked from our recent move and get organized...I can do this!!! Thank you for the chance to win! My goal is to take back my living space. Way too cluttered but I sure could find a great spot for your awesome giveaway. Hi, I forgot to give you my right email. It is ladyj711@live.com. Sorry, the phone rang I tried to finish my comment quickly but did it too quickly. This is another frosty beauty with beautiful colouring. I wish getting rid of the snow was as easy as blowing it away - it would sure help my husband avoid sore muscles from all the shoveling he has to do each winter. Thanks for joining us at Frilly and Funkie. Stunning card, Joanna! Happy New Year! I'm hoping for more crafty time this year. Thanks so much, Paulette S.
I re-read your instructions and noted that I only commented on being a follower.